Graves Motorsports LINK™ Cat Eliminator Titanium Exhaust System for the 2009-2014 Yamaha R1 with carbon fiber canisters. GMS LINK ™ Exhaust systems are designed for the elite rider seeking top of the line performance, fit, finish and value. 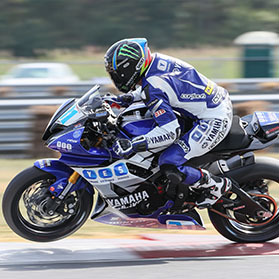 This R1 exhaust system was developed using the same technology that has powered Monster Energy Graves Yamaha riders to 6 consecutive Moto America / AMA Superbike championships along with numerous 600cc titles. This product is intended for closed course competiton use only. Use of this product for any other purpose is strictly prohibited. This combined kit features two parts of the LINK™ exhaust system options for your R1 including the slip-on and cat eliminating Y pipe. Specifically built with the riders’ needs in mind this setup allow you to start with the combination that makes the most sense for you as a rider and your budget (along with conforming to regulations for your type of riding). You can purchase the header seperately at any time to complete your LINK ™ performance package. Stock Cans + Cat System Weight = 19lbs. LINK ™ Cat Eliminator System Weight = 6.4lbs (see break down below).